George Washington Carver is not a figure generally associated with the Christmas season, but few men embodied the spirit of giving that the holiday represents better than this inventor, scientist, botanist, and artist. A true philanthropist, he gave his time and used his hard-won knowledge to better the lives of those around him. His accomplishments brought him fame, but not fortune because he believed the purpose of life was to help others, and to make a positive difference. "God gave them to me," he said of his many innovative ideas. "How could I sell them to someone else?" It was in that spirit that Carver refused to apply for patents for many of his scientific breakthroughs, and to bypass the riches dangled at him by Thomas Edison and others. Carver wanted to leave the world a better place than he found it. That he succeeded is a testament to his character and belief that anything is possible with hard work and imagination. The Civil War was still in progress when Carver was born to slaves in Diamond Grove, Missouri, sometime around January in the year 1864. He took the name Carver from his white slave owner, Moses Carver, who had purchased George's parents for seven hundred dollars in 1855. When he was still an infant, George and his mother were kidnapped by slave raiders. His mother was never found, but the Carvers rescued George, and adopted him and his brother. With abolition, Moses Carver and his wife Susan raised George as their own son. A sickly youth, he lacked the stamina to work in the fields, and instead helped Mrs. Carver around the house where he learned to make soap and candles, as well as spin wool and cure bacon. Mrs. Carver would teach him to read and write, and she and her husband encouraged the curious young man in his intellectual pursuits. The young man enjoyed spending hours exploring the woods, observing plant and animal life, studying their habits and also sketching them. "I wanted to know the name of every stone and flower and bird and beast," he wrote. "I wanted to know where it got its color, where it got its life – but there was no one to tell me." His quest for knowledge was combined with an appetite for spiritual growth. "I love to think of nature as an unlimited broadcasting station, through which God speaks to us every hour, if we will only tune in." Before long, he planted a garden in the forest. Carver's knowledge of plants was making him famous among the locals. His ability to cure plants earned him the title of the "Plant Doctor." The abolition of slavery did not automatically translate into opportunity for those freed from their shackles. Carver longed for a formal education, but racial discrimination prevented him from occupying a classroom at any of the local schools. Learning there was a school for blacks ten miles away in the town of Neosho, Carver journeyed there with his family's blessing when he was 13-years-old. He slept in a barn for awhile before he was taken in by a religious black family. The lady of the house was a trained nurse who taught him how to use plants for medicine. She gave him another valuable lesson that he would take to heart. "You must learn all you can," she told him, "then go back into the world and give your learning back to the people." The educational opportunities at the school were limited, especially for someone of such intellectual promise, and Carver moved on, drifting to various schools before earning his diploma at Minneapolis High School. His next step was to attend college, and after applying to various universities, he was accepted at Highland College in Highland, Kansas. Unfortunately, upon his arrival the college refused to admit him when they discovered he was an African-American. The next several years found Carver working odd jobs while also becoming a homesteader in Beeler where he plowed seventeen acres of land, planting rice, corn, and other crops without the aid of farm animals or helpers. Carver had not given up his dream of further education, however, and after acquiring a bank loan, left the area for Indianola, Iowa where he studied art and music at SimpsonCollege, becoming only the second African-American to study there. His talents impressed his art teacher, but she advised him against pursuing a career as a painter, believing few doors would open for an African-American in that field. He frequently used plants and flowers as subjects in his canvasses, and recognizing that Carver's interest in plants was not limited to their aesthetic appeal, his teacher suggested he study botany at Iowa State Agricultural College in Ames. Carver thrived in his field of study, impressing his professors, and graduating near the top of his class. Following the completion of his studies in 1894, he landed a job as an assistant botanist in the college greenhouse, becoming the first African-American member of the school's faculty. Two years later, on April 1, 1896, Carver received a letter from Booker T. Washington that would change his life. Washington was a kindred spirit. 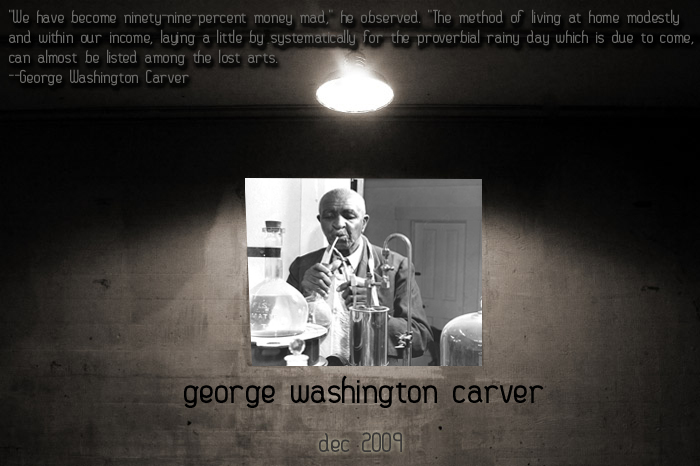 Like Carver, he was a former slave with a strong belief in the value of education. Washington's studies led him to become a teacher, and eventually the head of Tuskegee College in Alabama where he was dedicated to teaching the African-American student body the necessary skills to achieve economic independence. "I cannot offer you money, position, or fame," Washington wrote. "I offer you in their place work - hard, hard work, the task of bringing a people from degradation, poverty, and waste to full manhood." Carver accepted Washington's offer to teach at Tuskegee, but was dismayed to learn the college did not have a laboratory or adequate equipment to properly teach science. Carver's thirteen students who hoped to escape the backbreaking work of manual labor to which former slaves were consigned, were not impressed with their new teacher. One of his first orders of business was to take them on a field trip to a garbage dump where they collected old bottles, pans, wire, rubber, old lamps, and other discarded items. The students had underestimated their teacher. Those old bottles became Bunsen burners, some other items became beakers, and before long TuskegeeCollege had a functioning laboratory. After their skepticism turned to admiration, his students took pleasure in playing a game they called "Stump the Professor." Once they took the legs of a spider and the head of an ant and, in a small scale imitation of Frankenstein, attached them to the head of a beetle. Could Carver identify this strange insect? "I knew it was a fake," he said, but he played along, claiming it was a "Humbug." At the time, the South's economy was experiencing hard times. Years of growing nothing but cotton had taken a toll on the soil, depriving it of the nutrients, particularly nitrogen, necessary to grow a good crop. Carver was intent on finding a solution to this problem plaguing Southern farmers. He realized that some plants could take nitrogen from the air and feed it back into the soil. It was through growing black-eyed peas, soybeans, and peanuts, crops that were regarded as useless, that Carver solved the problem. As a test, he invited his skeptical students to his home for a dinner of pancakes, potatoes, and meatloaf, and surprised them later with the revelation that the entire meal had been produced with mashed black-eyed peas. "When I was young, I said to God, ‘God, tell me the mystery of the universe'. But God answered, ‘That knowledge is for me alone.' So I said, ‘God, tell me the mystery of the peanut.' Then God said, ‘Well, George, that's more nearly your size.' And he told me." Not only could peanuts provide poor people who couldn't afford meat with much needed protein, but after numerous experiments, he found he was able to make a variety of useful items from the crop. In an example of what Carver called "Cookstove Chemistry," he made rubber, ink, coffee, flour, dyes, soaps, cosmetics, and, of course, peanut butter. Using the peanut's red inner shells, he created writing paper, and learned that the outer shells could be used in the production of fuel. In all, Carver created 300 products from the lowly peanut. Carver didn't stop there. Farmers generally threw away leaves and other items regarded as little more than waste, but Carver believed that "nature produces no waste," and knew they could be used to replenish the soil. This led to another scavenger hunt in which he and his students collected organic waste materials and worked them into the soil, then stood back to see the result: bigger vegetables, a greater harvest, and richer soil. Sweet potatoes also came under Carver's microscope. From them, he created 118 products, including ink, flour, vinegar, molasses, rubber, and glue. Noticing how colorful the soil was in Alabama, the man who once aspired to paint also created economical but artistically sound paints for use by artists. Carver did not capitalize on his findings to build a fortune, but eagerly shared his knowledge with the poor farmers of the South. He published bulletins, such as How the Farmer Can Save His Sweet Potatoes, When, What, and How to Can and Preserve Fruits and Vegetables in the Home, and Help for Hard Times, the latter with a foreword by Booker T. Washington. He also traveled to farms in his mobile classroom, which he called the Jessup Wagon, to talk to farmers first hand about methods they could use to increase production at less cost. In the early 1920s, when Thomas Edison offered him a yearly salary of $100,000 to move from Tuskegee and continue his experiments in Orange, New Jersey, Carver declined. He also returned the $100 that a farmer who had benefitted from his research sent him as an expression of gratitude. Despite his many inventions and discoveries, Carver only applied for three patents. "We have become ninety-nine-percent money mad," he observed. "The method of living at home modestly and within our income, laying a little by systematically for the proverbial rainy day which is due to come, can almost be listed among the lost arts." God was always in Carver's thoughts, and beginning in 1906, he held a weekly Bible study class at Tuskegee in which he would often impersonate the characters from Scripture. When teaching the story of the manna-fed Israelites, he even produced a sample of manna he found in the woods near Tuskegee. "My discoveries come like a direct revelation from God," he said in a 1924 address in New York. "The idea and the method of working out a new product come all together. In half an hour after the idea was revealed to me, I produced the yolk of an egg from the Puerto Rican sweet potato." Carver would remain at Tuskegee College until his death, a total of 47 years, but his stay was not always rewarding. Some of his colleagues on the faculty resented that he received a higher salary and was provided with two rooms for his personal use whereas they only had one. Carver also clashed with Washington who assigned him the duty of administering the Agricultural Experiment Station farms, a job that required him to produce and sell farm products. Carver complained that he was being overworked with these additional responsibilities, and Washington complained that Carver lacked administrative skills. He did not lack for acclaim, however. In 1916, he was made a fellow of the Royal Society of the Arts in London. In 1923, he was honored by the National Association for the Advancement of Colored People with the Spingarn Medal for his many discoveries that revived the economic fortunes of the South. In 1935, he was appointed by the United States Department of Agriculture to research plant fungus, and at the decade's end was the recipient of the Franklin Roosevelt Medal for "Distinguished Research in Agricultural Chemistry." A year later, he was named Man of the Year by the International Federation of Architects, Engineers, Chemists, and Technicians for both his work in science and his "distinguished service to humanity." In 1940, he even appeared on movie screens. He agreed to play himself in his later years in a biographical documentary that The New York Times found to be "hardly worthy of its great subject, either in dramatic or scientific content, although its heart is in the right place, and its facts seem to be straight." Although he had earlier declined a potentially profitable association with Thomas Edison, he did accept an invitation from industrialist Henry Ford to assist in food experiments at Ford's Dearborn laboratories in July 1942. "The war has given the United States the greatest opportunity it has ever had to develop its own resources, if we only take hold of it," he said at a press conference where he also spoke of a preparation made from sweet potatoes that was better than chocolate. By this time, Carter's health was beginning to fail, and he died at his Tuskegee home on January 5, 1943. He was 78-years-old. In an editorial after his passing, The New York Times noted that though Carver was hailed by a material age for his inventions, "unlike these materialists, he was interested more in the poorest land and in unpromising material, and unlike them he was touched not only by something like genius but by a noble spirituality and simplicity." It was an "idealism that is rare in any race." The epitaph on his gravestone says it well: "He could have added fortune to fame, but caring for neither, he found happiness and honor in being helpful to the world." Carver said it even better: "It is not the style of clothes one wears, neither the kind of automobile one drives, nor the amount of money one has in the bank, that counts," he observed. "These mean nothing. It is simply service that measures success." Carver achieved his goal to leave the world better than he found it, and his innovative work continues to benefit mankind to this very day.